Stelara was in desperate need of a stream of communications to engage both potential patients and current patients. I worked with an art director to create a brand new stream of communication. For potential patients, I wrote five different emails and direct mails each focused on a benefit of Stelara. For our current patients I created seven different emails and direct mails engaging them in the many ways in which Stelara can support them in their journey toward clearer skin. 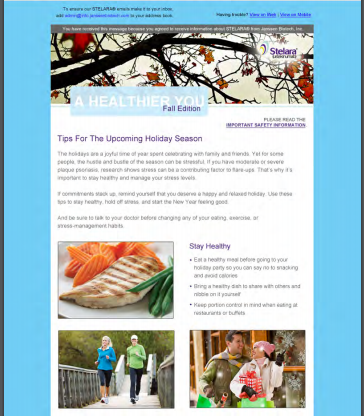 Linked is a sample of an email that is sent to current patients that provides healthy living tips.